Yesterday, I rehired my friend Gary Jackson to help build the RETROvan’s home base. It will eventually move from the driveway to become an integral part of our patio and courtyard area, secured by front and rear gates. The first step is to demolish our ugly fence and gate. This photo was taken from where the rig’s back doors will be. Gary will be building a 30’x11′ RV pad where that wood pile is. This was a major find today. 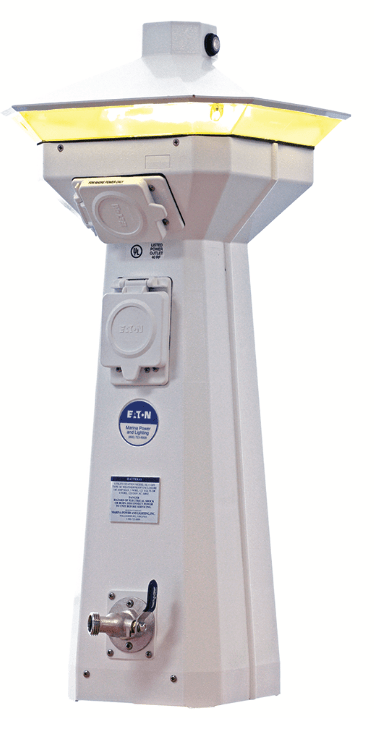 It’s a Hatteras Marina Power Pedestal, made by EATON. I custom-ordered it with dual 30A/20A outlets, a digital kW meter, ethernet jack, coaxial cable jack and fresh water connection. The top is an amber LED light that runs off a photocell (dusk to dawn). The 30A outlet will face the rig’s side for shore power, and the 20A outlet will face the patio for running tools, lights, a hot tub, etc. The cost was $658, but it fits the RETROvan’s “space marine” theme to a tee. I won’t have it for two weeks so I had to postpone Frahler Electric until after Labor Day. But that gives Gary and me some extra time to dig the trench and run the conduits. It’s also important to get the RV pad’s concrete cured before the rainy season starts in Portland. And oh yeah — yesterday’s eclipse was spectacular! Previous PostAbsolutely RivetingNext PostOh, Screw It.